Earth, air, fire, and water. Forest, desert, ocean, and sky… All in one very beautiful blanket. 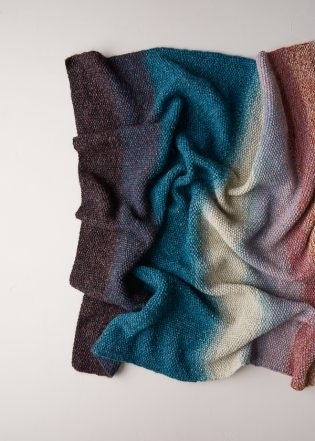 Our Nature’s Palette Blanket is for the nature-loving, the color-obsessed, and the fiber-infatuated! An afternoon sky peeks through a redwood forest canopy; a setting sun casts a lavender glow in the sky; and inky blue slides into deep eggplant as dusk turns to dark. 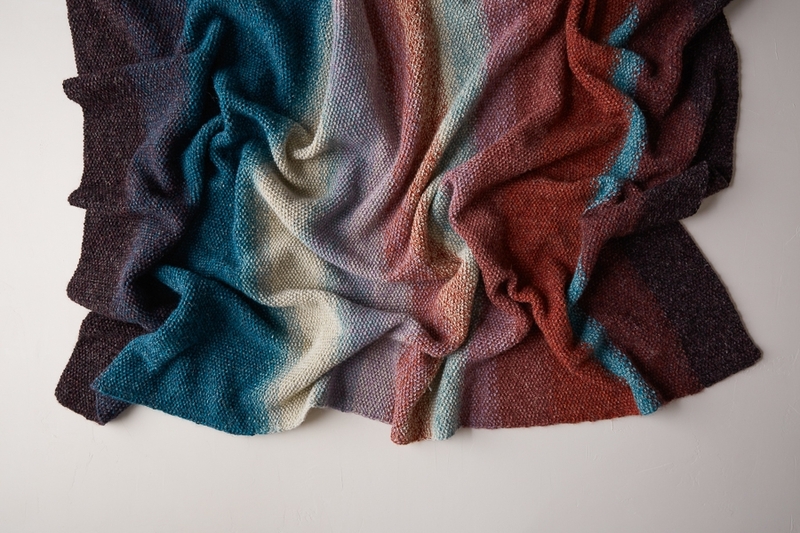 The interpretations are endless, which means you can bring your own experiences to bear on this stunning blanket’s color flow. 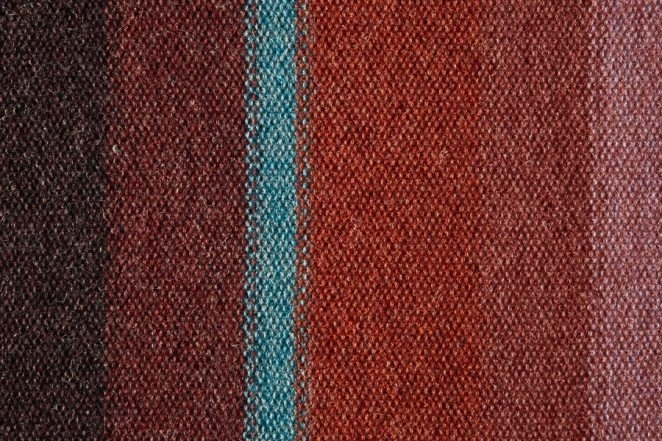 This unfettered color play wouldn’t be possible without the 17 new colors we just added to our Linen Quill collection. 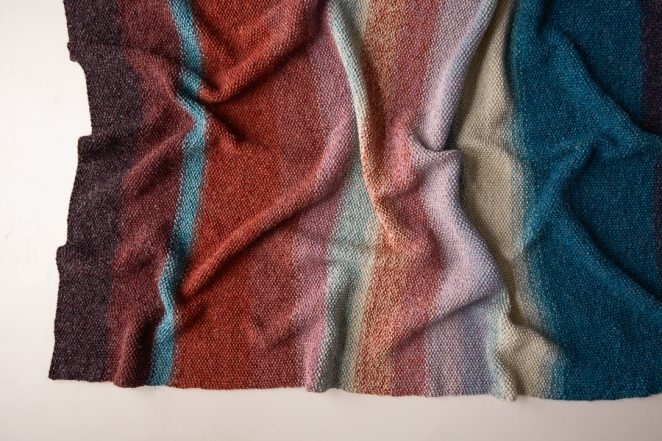 Its raw blend of fine highland wool, alpaca and linen conjures nature’s rugged beauty and is the perfect foil for this blanket. 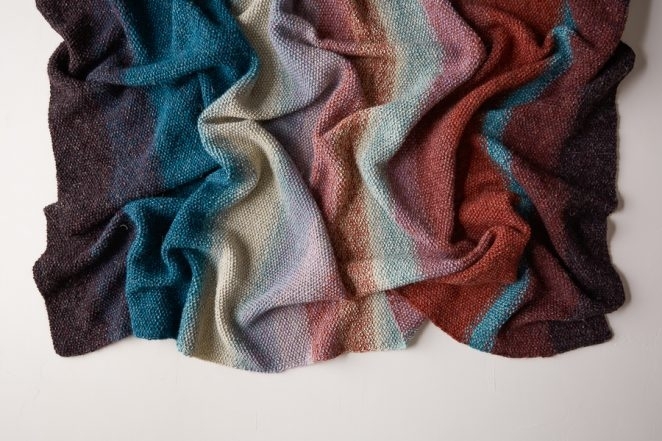 In double stranded seed stitch, the texture and heft of the Nature’s Palette Blanket add a whole other layer of satisfaction. To smoothly transition from one color to the next, we hold two different color strands together and alternate colors for a few rows at each color shift. 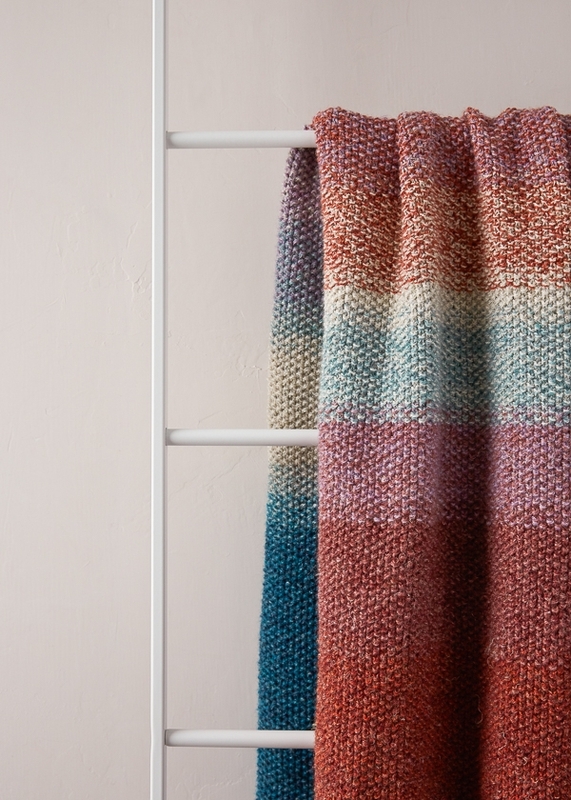 We put together the 14 skeins you’ll need in our Nature’s Palette Blanket Bundle, making it easy for you to get started on your gorgeous blanket! NOTE: A few customers have been a handful of yards short of True Turquoise. Please make sure you’re getting the correct gauge and also be sparing with your True Turquoise ends! To be extra, extra safe, feel free to tack on an extra skein of this color. Wait to wind it into a ball so that, if you don’t end up using it, you can return it within six months for store credit! Row 1 (right side): K2, *p1, k1, repeat from * to last stitch, k1. Row 2 (wrong side): Slip 1 purlwise with yarn in front (wyif), *k1, p1, repeat from * to last 2 stitches, k1, slip 1 purlwise wyif. The Color Change Rows transition from the Original Color to the New Color over the course of 4 rows. Set-Up: After completing instructions to work in Stitch Pattern in Original Color, cut yarns, leaving 10-yard tails. Wind the tails into one small ball. Row 1 (right side): With New Color, k2, *p1, k1, repeat from * to last stitch, k1. Slide work (see below). Row 2 (right side): With Original Color, *k1, p1, repeat from * to last stitch, k1. Turn work (see below). Row 3: (wrong side): With Original Color, slip 1 purlwise wyif, *p1, k1, repeat from * to last 2 stitches, p1, slip 1 purlwise wyif. Slide work. Row 4: (wrong side): With New Color, slip 1 purlwise wyif, *k1, p1, repeat from * to last 2 stitches, k1, slip 1 purlwise wyif. With Color A (see Notes), cast on 195 stitches. Work in Stitch Pattern (see Notes) until piece measures 4 inches from cast-on edge, ending with Row 2. With Color C, work in Stitch Pattern for 10 inches, ending with Row 2. With Color F, work in Stitch Pattern for 3 inches, ending with Row 2. With Color H, work in Stitch Pattern for 2 inches, ending with Row 2. With Color I, work in Stitch Pattern for 2 inches, ending with Row 2. With Color J, work in Stitch Pattern for 2 inches, ending with Row 2. With Color K, work in Stitch Pattern for 2 inches, ending with Row 2. Work Color Change Rows 1-4, adding in Color L.
With Color L, work in Stitch Pattern for 2 inches, ending with Row 2. Work Color Change Rows 1-4, adding in Color N.
With Color N, work in Stitch Pattern for 5 inches, ending with Row 2. With Color D, work in Stitch Pattern for 1 inch, ending with Row 2. Work Color Change Rows 1-4, adding in Color O. With Color O, work in Stitch Pattern for 4 inches, ending with Row 2. With Color A, work in Stitch Pattern for 4 inches, ending with Row 2. 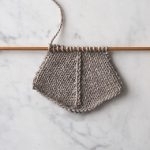 Hi, I have just been watching your long tail cast on videos – would you consider doing the cast on in seed stitch for this – you show both long tail cast on in purl and knit?? What do you think? Thanks for reaching out! Interesting thought! We have never tried it. We find that a standard knit long tail cast on works just fine here and creates a lovely cast on edge. That said, you could always give it a go! Might stay with the original – why change something when its not broke? Would love to share photos when this is made – are you #purlsoho on instagram? I am working on the paint pail pullover and have fallen in love with Linen Quill! 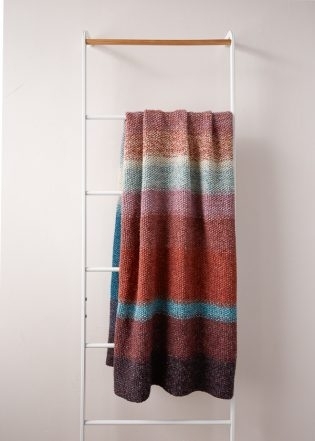 Now I am contemplating this blanket as my next project…but I love Honey Pink, one of the colors I got for my pullover. 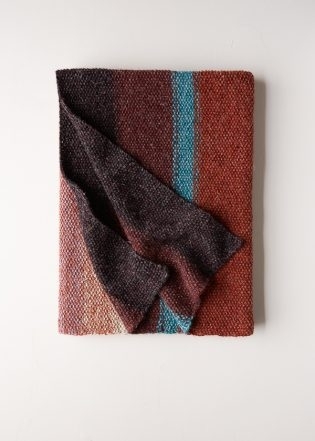 Would that work in this blanket if substituted for the Crocus Bud? Alternatively, to play up the Southwestern palette, would the following color palette work or do you have better suggestions? Thank you for reaching out! I’m so happy to hear you love Linen Quill as much as I do. I think the color palette that you have created would be gorgeous and I think you should go for it. Let us know how it goes and be sure to send us a photo of the completed blanket! I’m in the process of making this blanket. 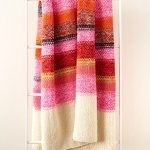 Love the yarn, love the colors, texture, pattern. It will be an heirloom! Thanks for writing in! Everyone’s gauge is different, and while it’s not common, it’s certainly not unheard of to have to adjust by two or three needle sizes to obtain the correct gauge. Our gauge was measured over seed stitch with the yarn held doubled, so it sounds like you are knitting it correctly! I just received my kit for the Nature’s Palette Blanket. I love the yarn! I see from reading other posts that I will have some yarn leftover. I would like to add about 20 stitches to the width. Will there be enough yarn? Thank you. Thank you for reaching out! Because we used a different amount of each skein you will end up with different amounts left over with a a good amount let for some colors and no yarn left of others. This just would mean that if you wanted to make it wider you might want to make some sections wider than others depending on the quantities of yarn you have. All this being said, you will have plenty of yarn to create a wider blanket. Ok – I am now going to apologise profusely for how silly this question is – long tail cast on and then Row 1? Is that correct? Nothing silly like start with Row 2? No question is a silly question. You are correct, you do your long tail cast on and then you begin your first row. Hello! I have started this beautiful blanket and have a question about the color change rows. After row 1 when you slide work, and then start the new color for row 2…. will there be yarn tails then coming off of both side of the blanket? Hopefully that makes sense. Thanks for reaching out! During the color change section, you are correct you will sometimes one color attached to each side of the blanket and will either turn or slide your stitches to get to the edge with the appropriate color attached. 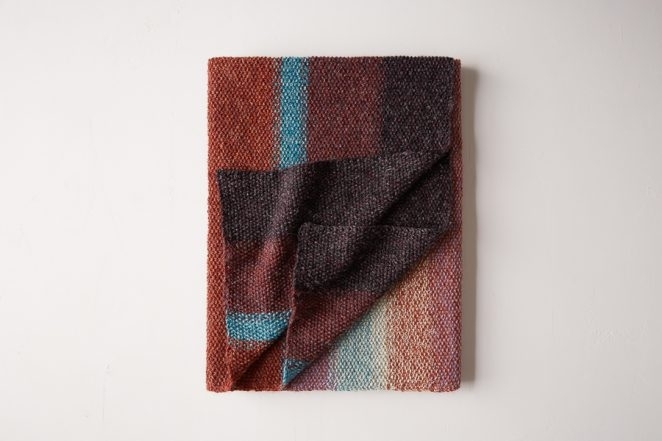 This blanket is incredible. I got my kit four days ago and can’t stop knitting. I’ve already ordered bedding to match the gorgeous palette. Thank you for the amazing project. Sorry, just casted on my blanket but for the life of me I can’t figure out what I’m doing wrong! I’m ending up with rib, all my knits get knitted and purls get purled. I knit 2, then p1k1 so: kkpkpkpk etc. slip,kpkpkpk etc. No matter what I do there is no offset so no seed stitch. What am I doing wrong? Thank you for reaching out! The seed stitch is created by your knits and purls being offset from row to row. This means that if you are off by just one stitch you will get a rib stitch. It sounds like you are interpreting the pattern correctly so the first thing I would recommend is double checking your cast on number is correct. Hi — Do you cut the excess from the ten yard tail after completing the color change? Thanks. Thank you for reaching out! You will leave the excess and when the blanket is completed you will weave in all of you ends. Hey there, I just started my blanket and the pattern that I downloaded a few months ago is different from the one above. In mine it says to cut 8 yard tails but in this one it says 10 yard. Which one should I use? Thank you for this question, good catch! The current pattern that says 10 yards is the correct version. I splurged in this yarn kit in August and am slowly knitting through the rows. I am certain I won’t have enough True Turquoise to do the Color D rows toward to the end of the blanket. I’ll be starting the color change from C to D tonight and will know for certain. 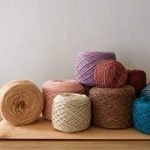 Do you sell smaller skeins of the linen quill? Thanks for reaching out! I’m so sorry to hear you might run out of True Turquoise, but I am hopeful that you might not since we only used the first section of Color D is only 4 rows and the second section is only 1 inch, not including the color changes on either side. Unfortunately we only sell full sized skeins of Linen Quill, but rather than buying another skein if you are that close, I would probably shorten the first section of C by an inch or half inch if you haven’t gone too far yet! Do please contact us at customerservice@purlsoho.com if you run out! When I am measuring the number of inches before a color change, do I include the four color change rows, or do I begin measuring after these rows? This is a great question! You do not include the color change rows for this measurement. You are measuring just the color letter that it states in the pattern line. Thanks for writing in! We will certainly be getting more bundles back in stock soon! In fact, our mill is currently making the colors we are out of. While we do not have a firm ETA, we are hoping that they will arrive soon. You can sign up to be notified when we get it back in stock. To do so, go to the product page, select the color that you are interested in and enter your email address. When that yarn and color arrives, we will email you right away! 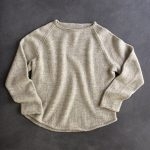 Can I do this pattern in Pure Cotton? Thank you! Thank you for reaching out! Because Cotton Pure has a larger gauge than Linen quill, you will have to do some experimenting with gauge to get a texture you are happy with. This blanket is knit holding two strands at once so to knit it with Cotton Pure I would recommend going up to a US10 or US11 needle. Once you have a gauge you are happy with, you can multiply your stitches per inch by 40 inches and round to the nearest odd number to figure out your cast on. Although Cotton Pure does not have the same color range as Linen Quill, I do think you could come up with a lovely palette to work with! I would suggest having about 24 skeins total. Hello, i am about 6 rows in and i must have picked up a stitch very early on. Somehow my rib is working out but at the end, i have to modify to make that happen. What’s the best way to fix? Thanks for reaching out! If you are off by one stitch the easiest way to fix it, aside from ripping back, is to just decrease by one stitch. Love the colors on this blanket, but I wanted to do it on bigger needles. I came into the warehouse and matched up colors ,(without the instructions) to use Super Soft Merino. Just now reading the directions and I realize I double the yarn. That will give me one cozy blanket, but what size needles should I use?? Or should I start over with different yarn? I wanted to knit on 10 or bigger needles? Your thoughts please. Thank you for reaching out! You have a couple of options; you could use Super Soft on a 10 and not knit two strands together which would give you a beautiful, but very different blanket, you could knit with two strands of Super Soft on a US 19 and get a luxurious chunky knit or you could knit with two strands of Flax Down on a US 10 needle. Flax Down because the gauge will work and the colors would work nicely as well. In my opinion you can’t go wrong with any of these, but let us know if you have any further questions as well as how it goes! In starting this gorgeous blanket I have confusion with regard to casting on! It sounds like I cast on with 2 strands, which is called Color A ? If so, how do I end up with a strand at each end of the needle upon completion of the first row? Thank you for reaching out! The first 4 inches of the blanket is just knit with color A which is two strands held together. You will not have working yarn on each side of your row until you begin your “Color Change Rows”. You’re sold out of the high tide and I would like to replicate the bundle. What color would you suggest in it’s place? Thanks for reaching out! I think that Juniper Green or Stillwater Blue could be lovely options. You could also start from the opposite end and by the time you get to high tide it will likely be back in stock. I love love love this blanket! 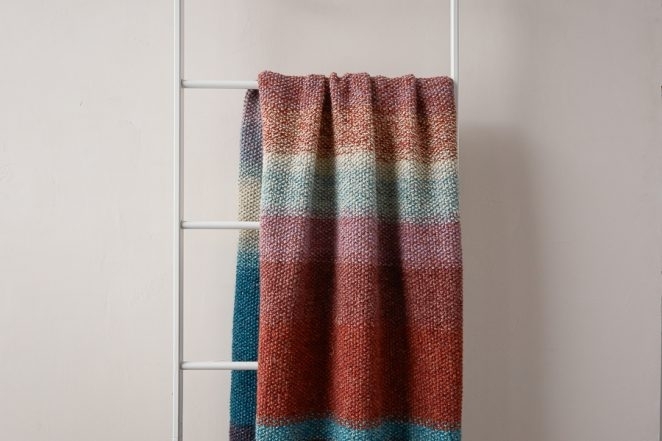 I am super-fast in Garter Stitch and am wondering how you think it will look in all garter? Will there be a significant size difference? I’m thinking I will swatch both, but wondering what you think or if anyone has tried it. Thanks for the inspiration! It’s just what I needed to have a big project going! Thank you for reaching out! 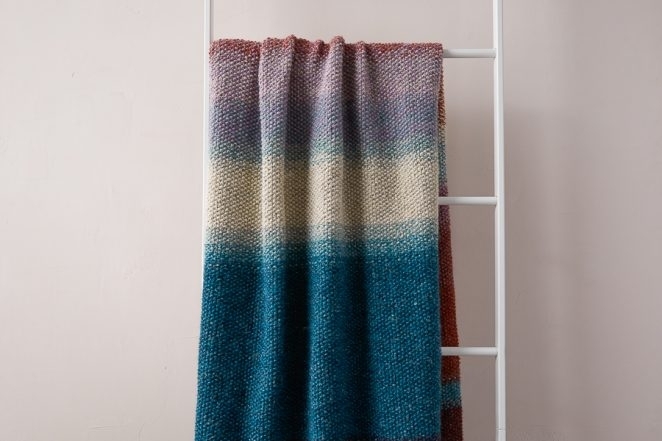 I think this blanket would be really beautiful in garter stitch, there will be a difference in gauge, but it shouldn’t be significant enough to be an issue. I would do it! Lets us know how it goes and happy knitting! Just to be clear, I imagine the colors we get one skein of we need to make into 2 balls so we can have double strands, correct? We always knit with 2 strands, sometimes the same color and sometimes mixed, correct? Do we cast on in double strand or single? Thank you! This is a great question-yes! you will always be knitting with two strands and you will be casting on with two strands. Ecstatic! My Nature’s Palette Blanket is complete – except for blocking. Any advice? So much material that I am disinclined to soak. Thought I might lightly steam, covered with muslin of course. What has been your experience. I will post photos on Ravelry after my daughter opens at Christmas. An aside to you Purl Soho folks. I was experiencing such anxiety with the thought of mailing this future family heirloom that, what the heck, bought an airline ticket so as hand-deliver from Minneapolis to Sea Cliff, Long Island. Never been to your store so perhaps will come into the City and stop by. Thanks for both your yarn and your unique designs, exquisite in their simplicity. Congratulations on your finished knit, and how sweet that you will deliver the blanket in person! Steam blocking will work well to shape this blanket, although I usually prefer wet blocking if for no other reason than a large project such as a blanket or sweater usually takes a long time to knit, and it picks up some dust and dirt along the way as well as skin oils from our hands while knitting, so wet blocking will also serve to wash these away. If you do decide to wet block it, I would recommend using the soak function in your washing machine as long as there is no agitation involved, and then running a spin-only cycle to squeeze out as much water as possible before laying the blanket flat to dry. Started this in July for a Christmas present, which was an extraordinary success! So much knitting but worth every stitch. I am loving knitting my nature’s pallet blanket, but I have noticed the oatmeal grey is different to other colours. I have just wound the ball and it is much larger than others, suggesting a very different construction and greater loft. The plying also looks looser. 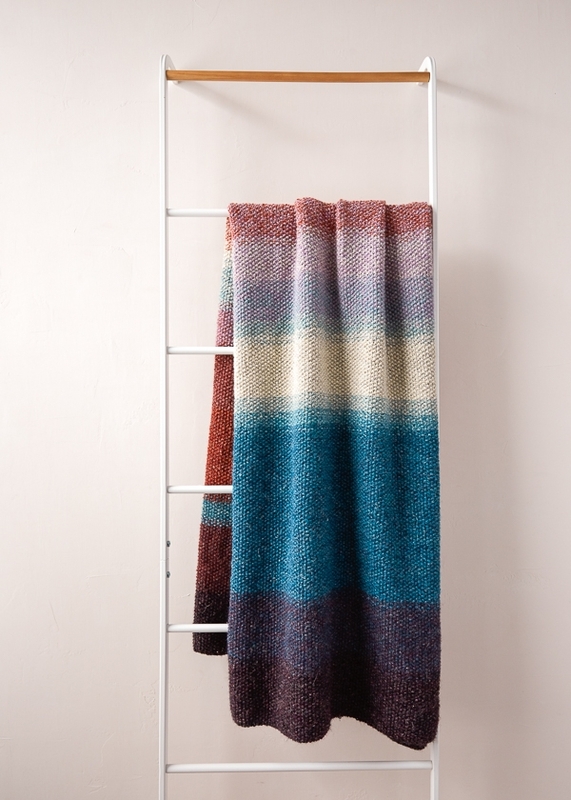 Will it knit up differently and distort the blanket shape? Thanks for reaching out! Although there is sometimes a bit of variation not only in color but also in loft in different shipments from our mill, we haven’t had any problems with newer batches of Linen Quill knitting up at a different gauge. Especially in a project like this, where you are always working with two strands held together, I wouldn’t anticipate any gauge issues, but please feel free to contact us at customerservice@purlsoho.com if you run into any! This is a beautiful project . I’m just getting started . This yarn is exquisite! Would you please explain “slide work”? Thank you for reaching out! When we say “slide work” we simply mean that instead of turning your work to work back across your row, you are sliding your stitches to the opposite needle point on your circulars where there will be the other color of yarn waiting for you to knit back with. I hope this helps, it is one of those things that sometimes doesn’t click until you try it or see it in person. Let me know if you have any further questions and happy knitting! So, my first few rows have turned into rib pattern. The pattern is seed stitch – correcet? Thank you for reaching out! You are correct, this is a seed stitch. It sounds like you are off by one stitch, I would double check your stitch count. I’m getting ready to start working on this beautiful blanket. I am puzzled about the instructions for color change rows, specifically “cut yarns, leaving 10 yard tails. wind tails into small balls. The tails stay attached to the work? What do you do with them, how do you use the small balls? Thanks for reaching out! Since some colors will be used twice during the color change section and need to be attached at opposite ends of the blanket, these 10 yard tails will ensure that you have enough yarn to knit the next few rows without having to cut and rejoin for each color change. I’m about a week away from finishing and thinking about blocking. I read the suggestion to use the soak cycle and then spin only. Should I use blocking wires and pins for this, or can I just lay it flat on a towel on our guest bed? The blanket is absolutely gorgeous! Congratulations on your nearly finished blanket! While blocking wires and pins are helpful if you need to stretch a finished project either to increase the size or open up a lace pattern, for a blanket like this I don’t think they’re necessary. After soaking and gently spinning out as much water as you can, I would just lay it flat to dry and reshape it using the edges of the mattress as a guide to keep the edges as straight as you can without wires. I am confused about the color change rows. 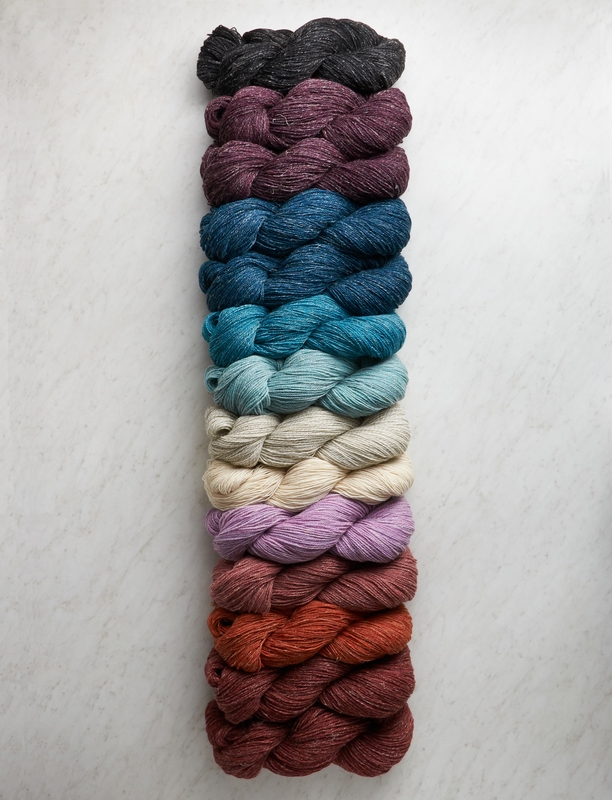 When you say set up…do you cut the old color yarn at 10 yards before you knit those last rows of the color change or after? I notice that one of the colors from the change is also in the new color. Do you use from different balls of the yarn? Thanks for reaching out! You will need to cut the 10 yards before working the color change rows – that way, in situations like this where one color is used for both combinations used in the color change, you will be able to work from the 10 yard tail for the old color and straight from the ball for the new color. I am wondering if there is any danger of the colors running when blocking this beautiful blanket. I would use cold water, of course, but blues and reds seem to run in other projects. 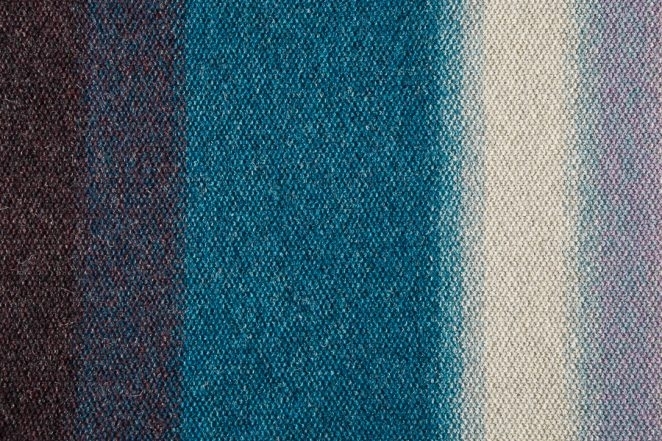 Is this beautiful Linen Quill colorfast? I need to know as I am nearing the end of this lovely knit. Thanks for reaching out! We haven’t had any issues or received any reports of Linen Quill bleeding, so you should be in the clear! If you are concerned, it’s never a bad idea to add a Shout Color Catcher or two for the first wash.
Row 2 starts with a p slip then you kp. So you end up knitting in a knit and purling in a purl and creating a rib. What am I missing? Should I start R2 with a slip purl wise then pk so I get the seed stitch? I counted my cast on more than once so I’m pretty sure I have the correct stitches. Thanks for reaching out! 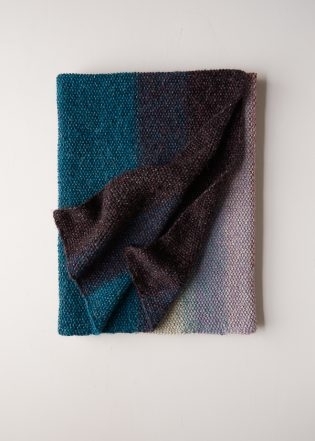 Since this blanket is worked over an odd number of stitches, it is correct that every row begins and ends with a knit stitch after the selvage stitch. When you end the first row with *p1, k1,* k1, and then turn, the two knit stitches at the end will now appear as purl stitches since the back of a knit stitch looks like a purl stitch. After you then slip the first stitch purlwise, you will now be knitting on top of a purl stitch which is correct for seed stitch. If you are having difficulties still, I would suggest knitting a small swatch on any odd number of stitches to make sure you are working the stitch correctly and then checking to make sure you didn’t accidentally knit or purl two stitches in a row during your first row, which would throw off your stitches at the end.